Is there anything better than great Macarons? Maybe great friends! Our little baker has made her first Macarons! She struggled a little with the folding in of the whipped meringue/egg whites and the almond flour/powdered sugar…sorry no pictures of that…mom was too excited watching grammy show her how to properly “fold” the ingredients! These beauties are vanilla with chocolate and strawberry filling. You can see that the 1st batch did not crack! She is becoming a master of the pipe bag, (I say generously as it is much more fun to squeeze then stop.) Kait has filled them and topped them. Tell me what you think?? Beautiful or what??!! Y a-t-il quelque chose de mieux que de incroyables Macarons? Peut-être des amis incroyables! Notre petit boulanger a fait ses premiers Macarons! Elle a lutté un peu avec le pliage de la fouettée meringue / blancs d’oeufs et la farine d’amande / sucre en poudre … désolé pas de photos de cela … maman était trop intéressé en regardant grand mére lui montrer comment correctement “plier” les ingrédients! Ces beautés sont vanille avec chocolat et fraise remplissage. Vous pouvez voir que le premier lot ne s’est pas fissuré! Elle est devenue un maître du sac à pipe, (je dis généreusement car il est beaucoup plus amusant de presser et pas s’arrêter.) Kait les a remplis et les a recouvrir. Dis-moi ce que tu penses?? Beau ou quoi ?? !! A beautiful couple, and a beautiful cake! Last weekend our amazing friends got married. Because they are such a beautiful couple we thought they needed an equally gorgeous cake. They requested this lovely floral naked cake for the reception. We think you might like it as much as we did. Take a peek! Billy at west valley glass is having a little girl! Yes aside from being on the PTSO board of my daughter’s school Oakwood Elementary, working for my Papas Vintage Yamaha Motorcycle company KDI Reproductions and being the Baker of all Bakers…I am an insurance agent for OHL Insurance agency. Billy and I go back at least 6 years and while taking care of a broken window, he told me they were having a little girl! I was so excited for them, they are the nicest couple. Billy did me the hugest solid and repaired my window for well below what he should have so I jumped at the chance to make this little gem of a cake for their last minute baby shower thrown by their sister. Is it possible for birds to be any cuter?! 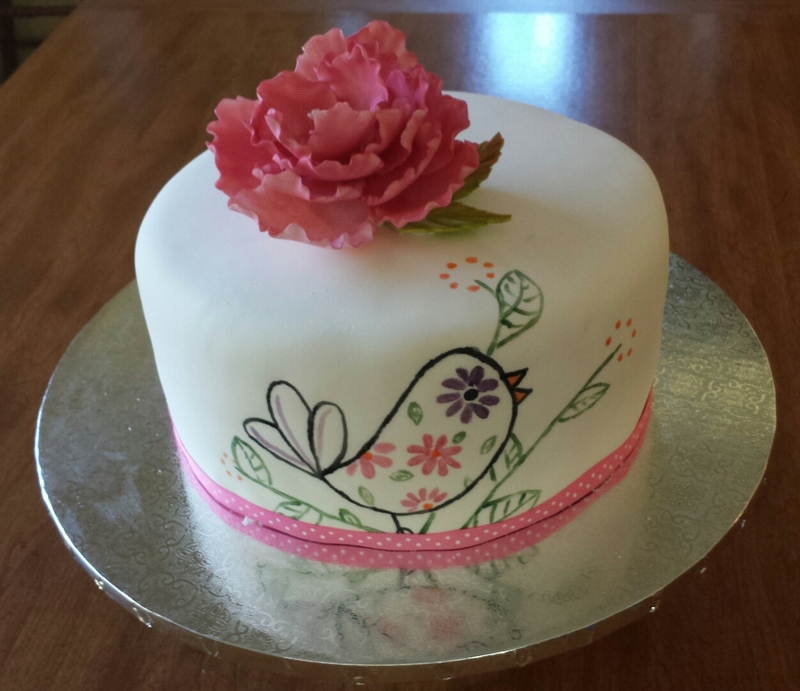 The cake is adorned with a hand crafted peony and hand painted bird. Tell us what you think is your favorite canvas?